Now one of the cornerstones of the Festival, the Muckno Mania Sprint Triathlon will enter its 10th year. The event which will take place on Saturday 7th July at Lough Muckno is a great, energetic start to Muckno Mania Festival Saturday Programme. The Triathlon course consists of a 750m swim in Lough Muckno, 18km cycle around the lake and a 5km culmination run through the forest. In addition to those competing as individuals, the Muckno Mania Triathlon encourages people to participate in teams, relays and duathlon categories. Registration will also take place on Friday 6th July 7pm-9pm and Saturday 7th July 7am-9am at Lough Muckno Gate House. 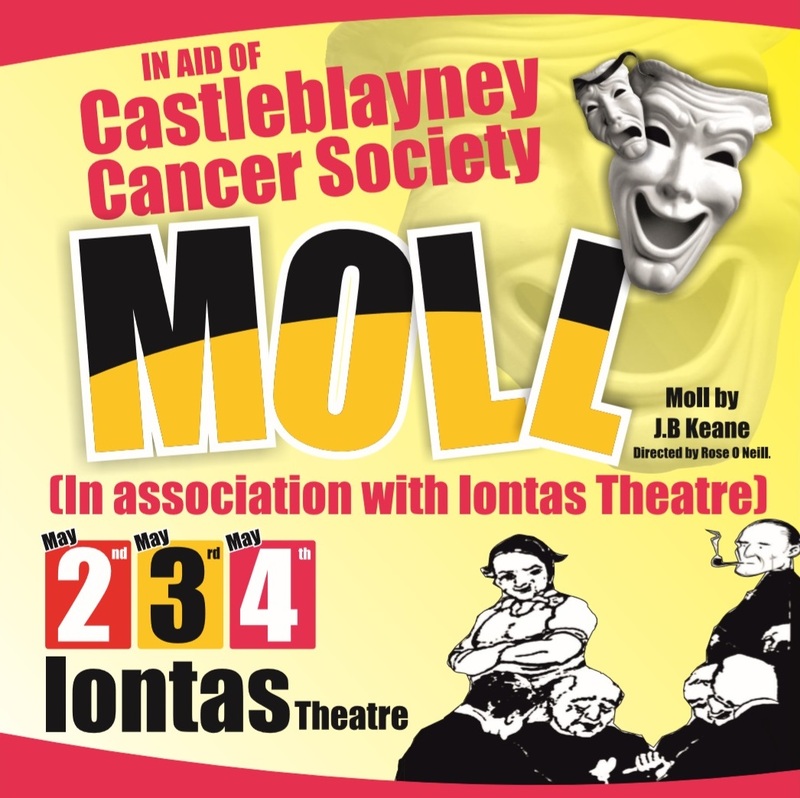 Íontas Theatre presents “Moll” a comedy directed by Rose O'Neill. The show is in aid of Castleblayney Cancer Society, taking place on Thursday 2nd, Friday 3rd and Saturday 4th May at 8pm in Íontas Theatre, Castleblayney. Moll is a hilarious and highly successful comedy by John B Keane set in the early 1970’s. The story is about a rural presbytery inhabited by a canon and his two curates who get a new housekeeper. Much hilarity ensues as Moll becomes the real leader of the pack! In November 2018, Monaghan County Council issued a tender for consultants, to complete a Structural Survey and Assessment of the Market House in Castleblayney.The purpose of the survey and report was to ascertain the structural integrity of the building. Alan Clarke & Associateswas appointed to compete the work and the conducted an initial site viewing in December 2018. On 25 January 2019, the structural engineer was unable to gain access to the Market House, following the collapse of an internal load bearing wall. The building was declared a public safety risk and a safety cordon was erected immediately to prevent access to the building and safeguard the public. The structural engineer conducted a Risk Assessment of the Market House and it identified a high risk from potential collapse or partial collapse of the roof and/or an external wall. The risk of collapse of the remaining roof presents a real and present danger to public safety. The Risk Assessment Report identified the need to reinforce the cordon around the Market House and a concrete barrier was required to prevent scatter of building material in the event of a collapse. The Council has met with Irish Public Bodies, its insurers, on-site, in relation to public safety. The Market House is a protected structure, of regional status. Monaghan County Council sought legal advice in relation to its responsibilities under the Planning Acts, in terms of Architectural Heritage and Conservation, and the need to protect public safety. Monaghan County Council has notified the Department of Culture, Heritage and the Gaeltacht and is engaging with the Department’s Conservation Architectural Advisor. The Structural Survey and Assessment of the building cannot be completed as it is unsafe to enter the site at present, due to the potential collapse of the remaining roof and debris from the collapsed internal wall. The approach adopted by the Council, in consultation with all interested parties, is to remove the unstable roof structure and clear out the debris from the internal walls, under the direction of its Conservation Architect. Once the risk of further collapse has been removed, it is proposed to complete the survey and assessment on the building. No decision in relation to the future of the Market House can be made until this assessment is completed. Monaghan County Council is currently procuring specialist contractors to complete these works, which is planned to commence in late April. The contractors will determine the method of operation in consultation with the Conservation Architect and it is acknowledged that this may have some impact on Main Street access over a short period of time. 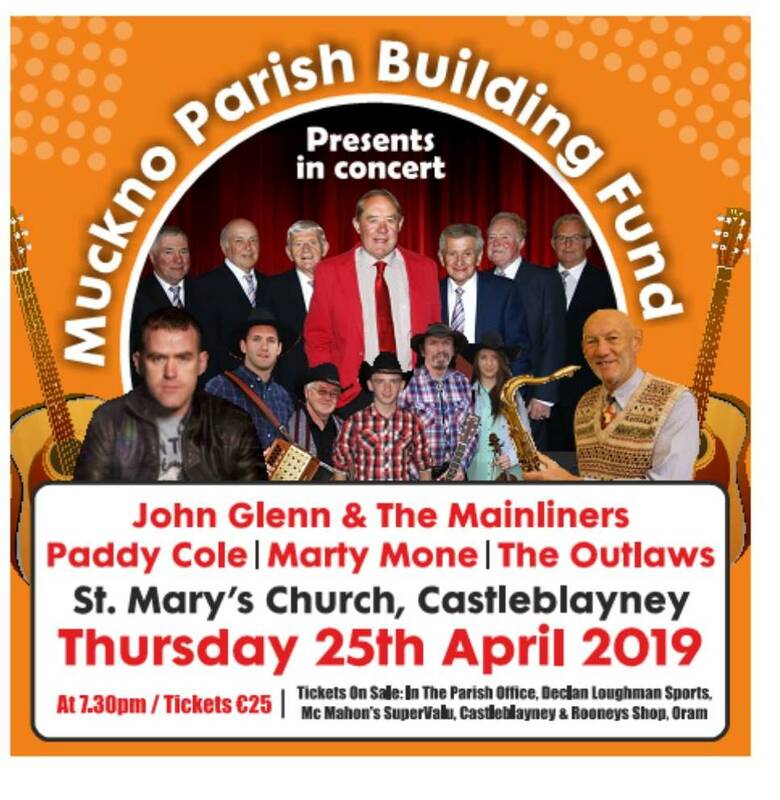 Muckno Parish Building Fund will host a concert on Thursday 25th April in St. Mary’s Church, Castleblayney at 7.30pm. The event will mark the re-opening of St. Mary’s Church after its extensive renovation and restoration. It is promised to be a memorable night with performance from John Glenn & The Mainliners, Paddy Cole, Marty Mone and The Outlaws. Tickets are €25 and can be obtained from: Muckno Parish Office, Declan Loughman Sports, Mc Mahon’s Supervalu, Sean Hughes, Castleblayney and Rooney’s Shop, Oram.